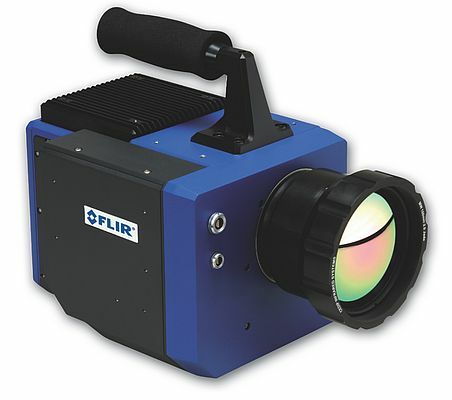 Capable of producing IR sub-band images at video rate within the SWIR, MWIR or LWIR regions, the FLIR Orion SC7000 infrared multispectral imager uses a state-of-the-art focal plane array (FPA) detector technology along with real-time, large dynamic range electronic modules to deliver high performance. Infrared radiation from the scene under investigation is collected through a front lens, designed to offer minimal aberration across the full IR wavelength range. A rotating filter wheel is inserted between the lens and the focal plane allowing instantaneous imaging of sub-spectral bands. The FPA detector is capable of capturing up to 400 frames per second, each high quality image being captured in snapshot mode. The series can also be used as a normal IR camera at full speed by removing or stopping the filter wheel. The compact size of the camera allows implementation of the FLIR imager into the smallest of spaces. The imager is available with a wide range of detectors enabling it to address any application in single and multispectral analysis. Each of them has a programmable frame rate and integration time. External triggering allows synchronization of the image capture to the most fleeting events. Three external analogue signals are synchronously acquired with the image allowing embedding external sensor measurements. The FLIR Orion SC7000 Series can be easily connected to a laptop computer through its truly plug and play and state of the art Camlink or GigE interfaces.